Spring has finally arrived!! And since warm weather is on its way, I thought it would be the perfect time to enjoy a fresh and tasty pasta salad. One that screams springs greens! Which is pretty much means a spring asparagus pasta salad, because I have been dying to jump into asparagus season. 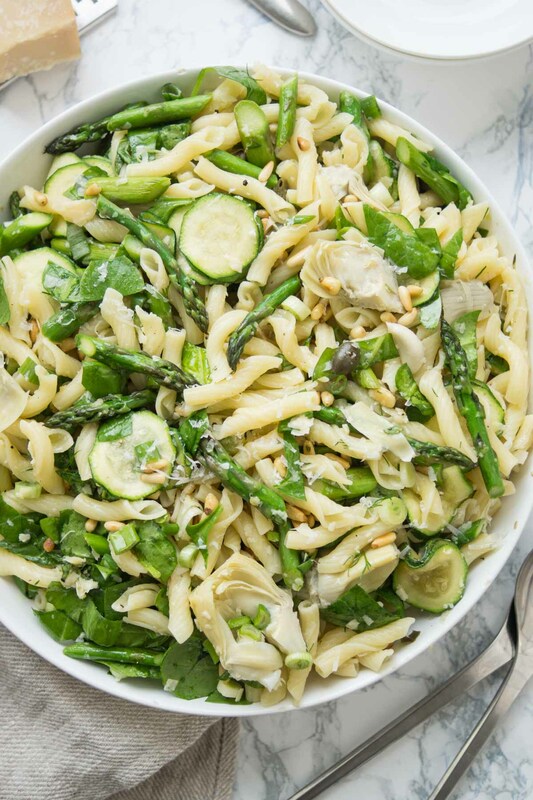 Green asparagus isn’t the only green in this spring pasta salad. There is also young baby spinach, sweet basil, fresh dill, and one super fresh farmers market zucchini. Yes, so this really is a “full of greens pasta” salad. One that satisfies my need, want, complete love of green foods. But it’s not green in the way you might think boring — NOPE, there are tasty artichokes, capers, pine nuts and parmesan together with a zingy dressing to liven things up. And it’s so simple to make. Seriously simple. The asparagus is braised in a skillet, just until al dente and the zucchini, well it’s only in there for a minute. Just long enough to warm it up and soften the texture ever so slightly. The key to a super tasty pasta salad is really fresh and quality ingredients. Because they impart so much more flavor which separates bland from over-the-moon-delicious. Jarred or fresh marinated artichoke hearts? What’s best? For this recipe, I used jarred artichoke hearts (not the oily kind) which is totally fine, but if you have the chance pick up some marinated ones at the market or your local delicatessen do it! They taste even better! And a little secret, I really love the herb-marinated packaged artichoke hearts at my local organic food store (Alnatura). Naturally, they are a little more expensive, but super tasty (you’ll find them in the refrigerated section). Nonetheless, my favorite Schwabe is a Schwabe after all and is perfectly at home with the supermarket variety jarred version. And that’s okay. There are so many other great things going on with this salad, they totally fit in! But of course, when it goes for quality, choose the best and freshest vegetables and go for the high quality olive oil – if I’m going to use the really good stuff, I want to TASTE how good it is. Same goes with red wine vinegar. You want to taste the joy. Torchiette pasta is a great, original shape. Or pick your favorite short pasta variety. So what about the noodles? I am the queen of changing things up with using funny shaped noodles in salads. But if I had to choose one, true and tried favorite, it would be farfalle… I think this is purely because of the way they look. Little bowties…little butterflies. And they are easy enough to find in a whole grain or spelt variety. But this time I choose little twisty noodles, called Torchiette, which in Italian means “little torches” — they were perfect. I would love to say that this spring pasta salad is vegetarian, but actually it’s not. Parmesan isn’t actually vegetarian. Surprise, surprise, but it’s actually produced according to traditional methods which use calf rennet (an enzyme that helps milk separate into curds and whey). So if you are following a strict vegetarian diet then look for a vegetarian alternative, Montello Parmesan or other hard cheese that is produced without with animal rennet. 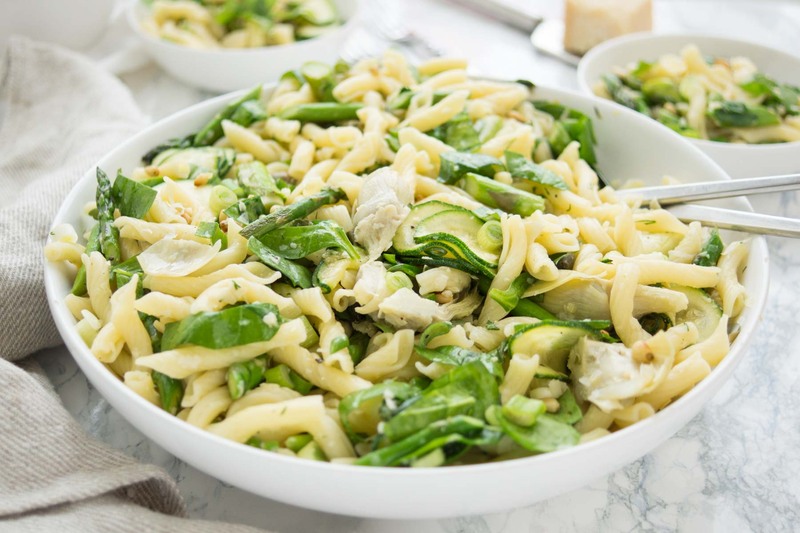 This easy Spring Artichoke Pasta Salad is quick and easy to make ahead and is SO delicious! Serves 4 as a main, or 6 or more, as a side. Cook the pasta in a large pot of salted water until al dente (according to package directions). Drain pasta and rinse under cold water for about 20-30 seconds until no longer hot. Set aside. Meanwhile, as the pasta is cooking, heat the oil in a large skillet over medium-high heat. Once the pan is hot, add the chopped asparagus, season with a generous pinch of salt and pepper, and stir to combine. Sauté for 4 minutes, stirring occasionally. Stir in the garlic and zucchini, plus 1 tablespoon water (this helps steam the vegetables) and continue sautéing for 1 minute more, stirring occasionally, until the garlic is fragrant. The asparagus should be tender but still slightly crisp on the inside and the zucchini only slightly cooked. Remove from heat and set aside. In a small bowl, whisk together dressing ingredients together in a small bowl until combined. 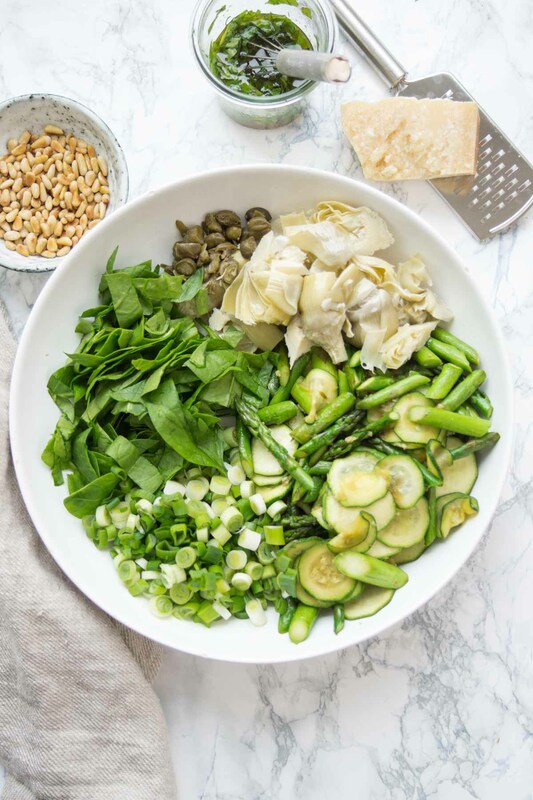 In a large bowl, combine the cooked pasta, asparagus mixture, artichoke hearts, green onions, capers, spinach, parmesan and toasted pine nuts. Drizzle with the dressing, then toss to combine. Serve garnished with additional parmesan, if desired. Enjoy! This spring asparagus pasta salad also keeps well. Just cover it and refrigerate it in a sealed container (for up to 2-3 days). If using capers in vinegar, rinse before using. I love my mandonline, even though it scares me to death. Please protect your fingers! It’s great for quickly slicing vegetables so that they are super thin. Or to Julienne them. I use this one, but if you don’t have one just slice the zucchini as thin as you can. 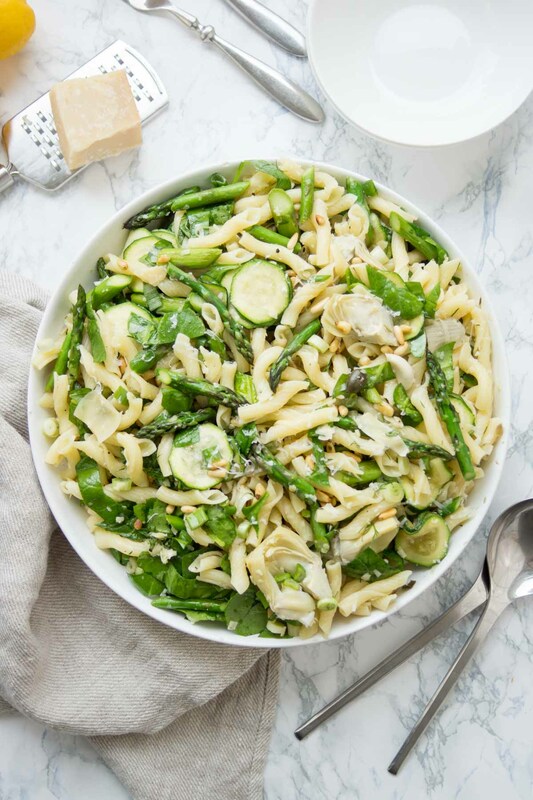 If you make this Spring Asparagus Pasta Salad recipe, I’d love to hear how it turned out for you! Be sure to rate it and leave a comment below to let me know! Especially if you have tips for other readers. Or take a picture and tag me on Instagram @ellerepublic and don’t foget to hashtag #ellerepublic so I don’t miss it!